Two serpentine dragons in one amulet, facing each other and holding a stone between them; the settings are in the shape of dragon’s teeth. Their wings frame the piece touching on top and below. Their claws weave their magic between them. 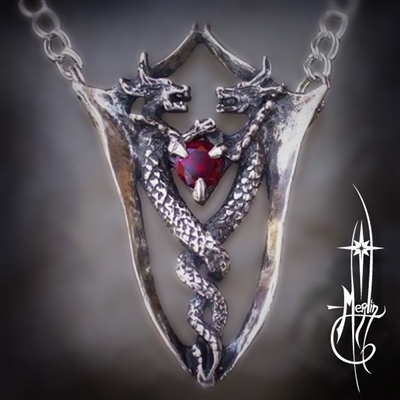 This Amulet of Dragons is about balance: a balance of energy suspended in mid air. Fierce dragons are known to fight each other, however these twin dragons hold their own space and provide a balance for each other: recognizing their differences, they support each other in flight, speaking to each other they credit each others perspective. They are the balance of opposites, yet they seem exactly alike: their scales, position and movement are dissimilar and because of those differences: support each other. This amulet is a reminder of how opposites attract, how different views expand perspective and how diversity strengthens us all. Where to get your Twin Dragons Amulet is one and a half inch tall amulet is designed for a stone set between each other and comes with an 18” chain permanently attached at the wings.